his weekend, as Israelis were marking the holy Sabbath, thousands of families across southern Israel had to spend this day running in and out of bomb shelters. 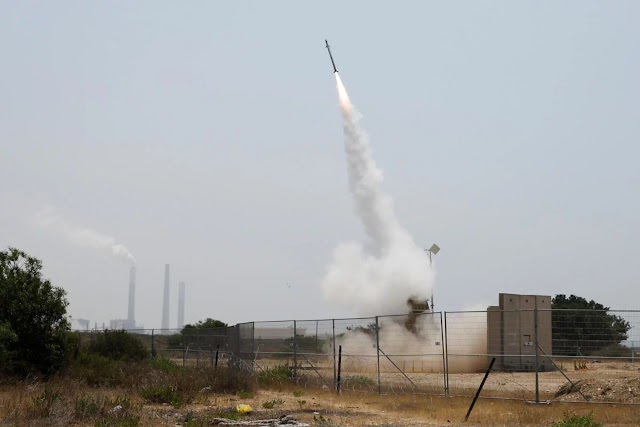 In the space of 24 hours, starting Friday evening, Hamas terrorists in Gaza rained down a barrage of over 200 rockets and mortars on communities in southern Israel, representing the single heaviest day of rocket fire since the end of Operation Protective Edge in 2014. One of these rockets hit a children’s play area in Sderot, while another hit a Synagogue. Thankfully both were empty at the time. Although a number of Israelis were injured in this assault, the only reason there were not more casualties is that whereas Hamas invests millions of dollars it receives in foreign aid for tunnels and rockets, Israel invests money in fortified bomb shelters and "Red Alert" advanced warning systems. That being said, the Red Alert gives families in the south of Israel no more than 15 seconds warning. That is barely the time it will take you to read this sentence! Imagine if even one rocket was fired on London, Paris, Brussels or Berlin? Or if a rocket was fired on your house of prayer or where your children were playing? Of course there would be, rightfully so, universal outrage, condemnation and an immediate, forceful response. Yet 200 rockets and mortars were fired on Israel in the space of 24 hours and what was the response from the international community? Virtual silence. This weekend’s rocket barrage of course also follows the recent wave of Hamas-led incendiary kite terror, which has scorched over 7,500 acres of precious land across Israel and ongoing attempts to infiltrate Israel. Yet that too has largely been met with callous indifference by the international community. Where is the outrage from the United Nations, where the General Assembly and Human Rights Council only few weeks ago held an "Special Emergency Session" to overwhelmingly condemn Israel for "excessive force" for defending itself from the unprecedented violence emanating from Gaza, yet gave Hamas a free pass? Again, largely silence, with the exception of the UN Special Coordinator for the Middle East Peace Process, who called on "everyone" in Gaza to "step back from the brink." There is a simple way to move back from the brink: Hamas need only cease the rocket fire, incendiary kites that have now scorched over 7,500 acres of land, and the attack tunnels. The fact of the matter is, mass terror attacks like this do not occur in a vacuum. They are the direct outcome of continued one-sided resolutions that single out and condemn only Israel, yet wholly ignore Hamas and Palestinian terror. By refusing to hold Hamas to account, the international community is only emboldening, empowering and encouraging the terror group to commit further attacks such as these. Meanwhile, one may also be forgiven for asking where is the EU’s outrage, given Brussels and some EU Member States are generally quick to slam Israel over settlement building, but are yet to say a word about the Palestinian rockets? What about the NGOs and the BDS Movement, which proclaim to champion human rights, justice and peace, especially in supporting the rights of the Palestinians? Are the human rights of Israelis no less equally important and worthy of your consideration? Where is the outrage from the mainstream media, which have either buried the story behind the crossword pages or inverted the role of victim and aggressor, leading with headlines focusing on Israel’s response, instead of the unbearable barrage of rockets that precipitated this? Meantime, as many, especially across Europe, continue to embrace the Iranian regime in the wake of the U.S. withdrawal from the JCPOA Iran Nuclear Deal, one may be forgiven also for asking where is the outage that Iran, which continues to call for the destruction of the State of Israel, is the primary funder and supplier of weapons to Hamas, including many that were used to fire on Israel this weekend? And lastly, where is the outrage from all those claiming that what we have witnessed in Gaza over the past months have been "peaceful protests?" Please ask yourself this: Does a "peaceful protestor" fire 200 rockets and mortars against a civilian population, including at children’s play areas and Synagogues, as the Jewish community mark their holy Sabbath day? Israel, like every sovereign nation, has the inalienable right to take whatever action necessary to defend its citizens. However, the international community must start taking Palestinian terror seriously and hold groups like Hamas to account, otherwise they will only be complicit in every rocket attack and mortar fired at the Jewish state. Vladimir Sloutsker is the President & Co-Founder of The Israeli-Jewish Congress (IJC).